Beans, Rice & Life: Bom-dia Brazil!!! I just spent an amazing week in Rio de Janeiro- Brazil and want to share some of my cultural and culinary adventures with you all! Brazilian cuisine is a unique combination of three main cultures: Native Indians (aboriginals), Portugese (colonizers), and the Africans (slaves). 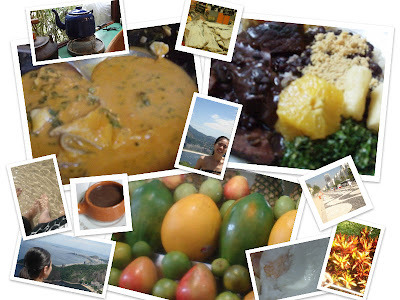 The ingredients and cooking techniques of these people are all integrated into the food that is Brazil. While Brazil has a very diverse immigrant community, including the largest Japanese population outside of Japan (Sao Paulo in secific), most of these other cultures have retained their own culinary identity and are not as integral to Brazilian cuisine. Over the next few weeks I'll be blogging about all things Brazil and sharing with you the deliciousness of Rio de Janeiro! Love the new layout!! Brazil is one of the places I want to check out before I die. Also, I saw your Ray's Hell Burger review back when you wrote about it. Good stuff girl for having the menu on there.